Elephants are the largest of all land animals in the world. There are two species, the African and the Asian Elephants. 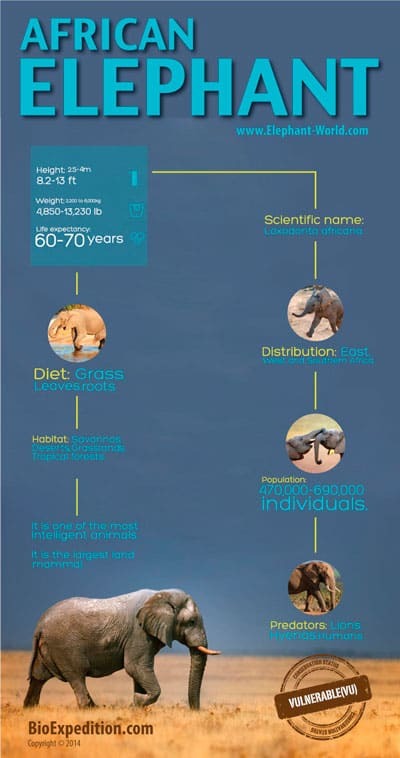 Feeding, Anatomy, Habitat, Distribution, Predators and all the information about elephants. 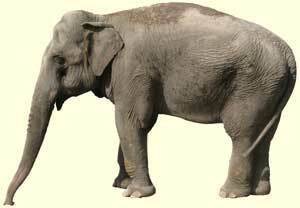 There are two recognized species of elephants, the African elephant (Lexodonta Africana) and the Asian elephant (Elephas maximus). African elephants are considered as vulnerable by the International Union for Conservation of Nature (IUCN) and Asian elephants are considered as endangered. Facts about Elephants, African Elephants and Asian Elephants. There are two species of elephants remaining in the world – the African and the Asian. They range in color from light to dark gray, with the most distinct features being their huge ears and tusks. These tusks though have resulted in the deaths of thousands of elephants though. That is because they are made from ivory. Even though it is now illegal to trade or sell ivory it continues to be profitable on the black market. Elephants are some of the largest creatures in the world. They are also known to be extremely intelligent. The saying that someone has the memory of an elephant means that they can remember just about anything and should be taken as a compliment. For the most part these are gentle animals but they will attack if they feel themselves or their offspring are in danger. They live together in herds and can live for many decades with the right circumstances. Elephants are known to form very strong emotional bonds. They are excellent with their offspring and they seem to get along in their herds for the most part. They have been seen displaying signs of distress and sorrow when one in their herd is injured or that it has died. The typical size of a herd is about 20 of them. There is a female that is called the matriarch and she is in charge of the herd. When there are too many in the group or food is scarce she will break them up into smaller groups so that there is a higher chance of survival. The males will leave the herd at about 14 years of age to join a male herd or to venture alone. Elephants are the largest of all land animals in the world. It takes a female 22 months from conception to have a baby. Elephants are in danger though of surviving in the wild due to the destruction of their natural habitat. This is a major concern as we don’t want to see these wonderful creatures being destroyed. Many of them live in zoos or they are part of circus acts. Since they are gentle for the most part, smart, and can move heavy items you will often find elephants helping to put up the tent at the circus. They are also used in many countries to carry logs and other heavy items. Those elephants that do have a good environment to live in can do so for 50 to 70 years. Many of the very old elephants die due to their teeth grinding away over the years. Then they starve to death as they aren’t able to chew food any longer. Even though females don’t mate until about 14 years of age, they can continue to do so until they are about 50 years old. Most of the time it is the males from 40 to 50 years old that mate. Females are attracted to these older males due to their age and their maturity. They are also among the largest of the herds out there. This is also a great way for the best genetics to continue being passed along to the future generations. It is no secret that the various species of elephants out there are all amazing creatures. However, the future for them is one that is threatened due to low numbers. While there are plenty of conservation efforts in place it has to continue and it needs to be widespread if they are going to have a solid future. Since they don’t really have any predators in the wild, it is up to humans to decide that protecting them is a priority. Without that mindset though the struggles for them will continue.